Welcome to our home for Galician research and historical videos, including videos of conference and regional meeting presentations and oral histories. We offer many videos which are free to view on our site, while others are only available to GG members who are logged into the Members Portal. 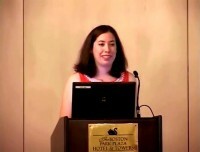 Scroll down to watch the tutorial video: “Using the New Gesher Galicia Website to Research Towns and Families,” which is an excellent primer on how to use all facets of our website by the woman who designed it, Brooke Schreier Ganz. We also offer two human-interest stories: "I Remember Jewish Drohobycz," with the late rabbinic scholar, David Einsiedler, and an interview (in Hebrew) with 92 year-old Shlomo Kahane, who was born in Grzymalow, Galicia (today Grimaylov, Ukraine.) Other methodology presentations are “Polish Magnate Landowner Records: Bringing the Lords’ Jews to Life," recorded at the 2013 IAJGS International Conference on Jewish Genealogy in Boston and the Gesher Galicia Spring 2014 Regional Meeting, which includes Galician research updates and the "Austria, Poland, Ukraine: 3 Countries, 5 Archives, 12 Wonderful Days of Discovery" lecture by Pamela Weisberger and John Diener in New York City. You must be logged in to view these videos. If you are not yet a member of Gesher Galicia click here to join. If you are a member, but can't remember your password, click here to have a password reset link emailed to you or contact webmaster@geshergalicia.org for further assistance. Come along on a tour of Gesher Galicia’s newly relaunched website! A one-stop resource for people interested in researching their families and ancestral towns from the former Austro-Hungarian province of Galicia, which is today split up between southeastern Poland and western Ukraine. The site features new content and resources for 400+ Galician towns and 2700+ Jewish Galician families. It also has nearly 100 searchable online articles and 50+ full PDF issues from almost two decades of “The Galitzianer”, Gesher Galicia’s long-running quarterly publication about Galician Jewish life. Learn about our searchable inventory page of 1700+ maps, landowner records, and tax records from Galician towns. And newly online is the Gesher Galicia Family Finder, enabling members who are logged into the website to access new features and connect with other researchers. An update on Gesher Galicia’s research projects and initiatives, website and All Galicia Database features, followed by a talk on the April 2013 trip taken by Gesher Galicia board member, John Diener, from Ottawa, Canada, and Gesher Galicia president, Pamela Weisberger to Austria, Poland and Ukraine to explore their mutual heritage and the resources available to genealogists. Join them as they visit the Staatsarchiv and the surveying (BEV) office housing Austrian cadastral maps in Vienna, the new Museum of the History of Polish Jews in Warsaw, followed by a dinner with the great-great-grandson of Count Leonard Pininski, who once owned the town Pamela’s grandfather and John’s father were born in, then on to the Polish State Archives in Przemysl, and over the border to Ukraine, where they travel with Alex and Natalie Dunai to Lviv and Ternopil visiting archives and memorial sites of a vanished Jewish heritage. Shlomo Kahane, was born Salomon Kahane in 1923 in Grzymałów (Гримайлів, Hrymailiv, Grzymalow, Rimalev, רימאלאוו) a small town near Skalat, Ukraine, which was formerly Galicia, and then Poland. He left Grzymałów for Palestine with his parents when he was a teenager, but his other relatives stayed behind. (His uncle was David Kahane, and author of “Lwow Ghetto Diary,” who was hidden by the Ukrainian archbishop of the Uniate Catholic Church in Lwow. Shlomo’s father Pontiel Kahane was David’s brother. Another uncle, Wolf Kahane, survived the war hiding in the forests near Grzymalow, and was the grandfather of Will Kahane who shot the documentary, “House Number Seven,” about his return to Grzymalow in 1996.) Shlomo served in the British army and resided in Tel Aviv. 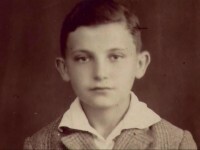 In this interview, conducted in January 2014, he recounted growing up in Grzymalow, life in nearby towns and villages, the tenor of shtetl life in the 1920s and immigration to British Mandate Palestine. This was the first video interview he had given. Shlomo passed away in the fall of 2014. May his memory be a blessing. ( The interviewer was Zack Oryan Orasz and the videographer was Robby Berman.) It is entirely in Hebrew, but Gesher Galicia plans to subtitle it in English soon. Magnate records are often unstudied, but hold great genealogical and historical value. This talk covers a brief history of Galicia, explaining the symbiotic nature of the Magnate-Jewish interrelationship, where Jews sustained the economic institutions, while magnates furnished an environment for Jews to conduct religious and commercial activities. Magnate records are held in the Central State Historical Archive in Lviv and the Stefanyk National Scientific Library. Learn how to identify the magnates who owned the towns where your ancestors resided and access their files, along with the structure and contents of their record collections. View examples of “Inventories” dating to the 1700s using patronymics, lists of Jewish residents and tax-payers, contracts and occupation lists and records in 1853-1858 documents of the Austrian Empire State Commission on the liquidation of serfdom. Discover Jewish Magnates! Your ”bubbe maises” about the great-grandfather who was a landowner (or even a Baron!) can be quite true. Wybierz się z nami na wycieczkę po nowej wersji strony! Niewyczerpane źródło dla osób poszukujących rodzinnych korzeni i miejscowości w Galicji – byłej prowincji austro-węgierskiej – która obecnie leży na terenie południowo-wschodniej Polski i zachodniej Ukrainy. Strona zawiera nowe treści i źródła dotyczące ponad 400 miejscowości galicyjskich i ponad 2700 rodzin żydowskich z Galicji. Znajduje się tu także prawie 100 artykułów online, w których można wyszukiwać oraz ponad 50 pełnych wydań “The Galizianer” (z prawie dwudziestu lat, format PDF), który jest od wielu lat kwartalnikiem Gesher Galicia dotyczącym życia społeczności żydowskiej w Galicji. Zapoznaj się ze stroną, na której można wyszukiwać, zawierającą ponad 1700 map, aktów własności i dokumentów podatkowych z galicyjskich miejscowości. Najnowszą zaś opcją jest wyszukiwanie rodzin Gesher Galicia, które pozwala zalogowanym członkom uzyskać dostęp do nowych funkcji i nawiązać kontakt z innymi badaczami.